The SEC’s number one lawyer and his two brothers, have been sued because they inherited more than $1.5 million in fraudulent profits from their mum’s investment in Bernie Madoff’s Ponzi, the NY Post reports.So basically, after the SEC seemingly ignored Madoff’s gargantuan fraud, one of its most senior employees, David Becker, profited handsomely from it. 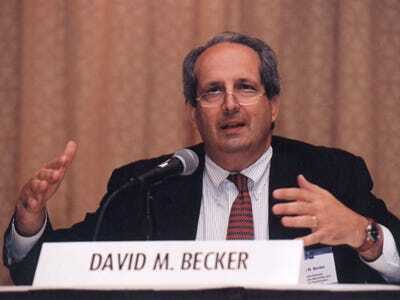 Becker is the SEC’s general counsel and senior policy director. He told the Post that he had no idea that his parents were invested with Madoff. But considering Becker might have advised the firm not to pursue Madoff because of it being too much paperwork — a charge that’s been leveled at the SEC — this may raise questions about conflict of interest. Now, he and his brothers join the long list of people from whom Madoff trustee Irving Picard is trying to clawback stolen funds for victims. According to Picard’s suit, Dorothy Becker’s estate received more than $2 million from Madoff Securities. Dorothy died in 2004 and her three sons, including David, became co-executors of her fortune. Becker was a partner in law firm Cleary Gottlieb Steen & Hamilton, before he was tapped by the SEC for the second time — he was also the regulator’s general counsel between 2000 to 2002. He’s actually relinquishing the post next week, to return to the private sector. The suit cites two withdrawls of funds that were partly made up of profits from Madoff’s firm: $1,648 in late 2004; and $2.04 million in February 2005.